When developing a security plan for your commercial facility, there are a lot of factors to consider. This includes whether something like louvers can be of benefit. The right approach towards commercial security includes keeping everything safe. Whether this is physical property, data, employees, or your clients, a good security plan is essential in keeping everything safe. 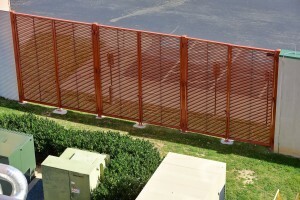 There are a lot of elements that can go into a commercial security plan, including everything from a CCTV system to more traditional security barriers like fences or, yes, even louvers. Knowing how to create a commercial security plan—and implement louvers where applicable—is an essential part in securing any commercial property. Just like many things, commercial security plans benefit from planning ahead. If you’re able to design your facility with louvers in mind, it gives you much more control over how they are implemented into your security protocols. Even if you aren’t aware of all of your needs off the back, it’s best to plan ahead where possible and think about how foot traffic flows and what can be done that won’t reduce any efficiencies and will keep things moving as they should be. For example, you wouldn’t want to install new security louvers only to realize that not everyone knows how to access them, so taking the time to plan ahead can go a long way in ensuring that everything runs smoothly. Where do you want to prioritize your security efforts? Figuring out just what physical security vulnerabiltiies are a problem for you and your property can help direct you in your commercial security plan development. It may take installing modern technologies like an access control system or you may just need to add in some custom louvers to handle some of your security concerns. Regardless, taking a walk around your facility and keeping a list of any possible vulnerabilities is a useful thing to do before any discussions on how you can improve your security. Transparency is important when making sure that both employees and visitors understand just what’s going on with your security. All employees should be trained on the basics of security, including knowing how to use access control systems, knowing what areas are accessible to them, and knowing where emergency exits are. On the other hand, proper signage can go a long way in letting guests know just where they’re supposed to be. This entry was posted on Monday, April 1st, 2019	at 3:17 pm	. You can follow any responses to this entry through the RSS 2.0 feed. Both comments and pings are currently closed.